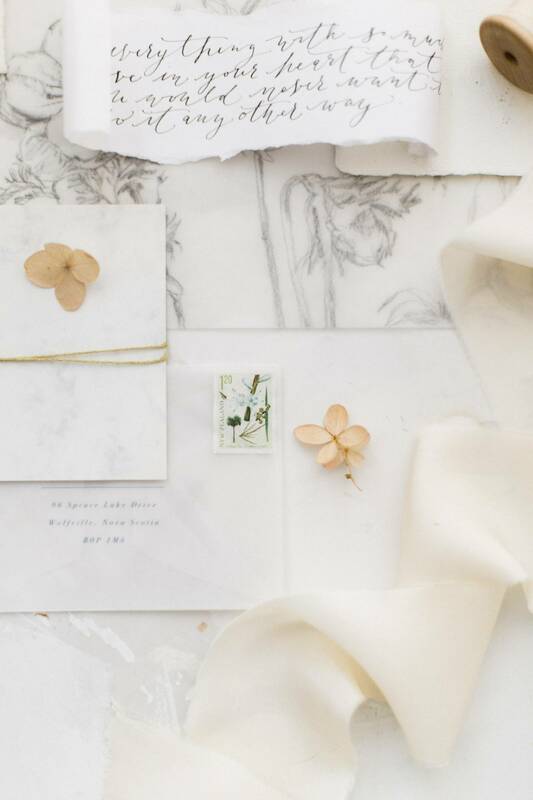 Inspired by linen and organic textures NICOLE LAPIERRE PHOTOGRAPHY created this vision of an intimate elopement starting off with the couple in their home environment before heading out into nature to say their vows. Nicole tells us, "Siera Bearchell is the Miss Universe Canada 2016 winner. A little back story about her win last year, when she was crowned, she received so much negativity because of her figure, and was called fat, in addition to other things that were very mean. She used that body shaming experience to help make a difference for women and self love. She reached out to me to have a shoot done with her fiancé Brennen that would incorporate their elopement, so I suggested a curated story that would be beautifully intimate of their morning on the day of their elopement, and then capture them taking their vows with just the two of them. I wanted to incorporate the fall season in the floral and components of the setting. Muted tones complimented her dark hair and beautiful features. The light coming into the space was very important to setting the tone of the shoot. I love when couples choose to incorporate their home into their engagement or elopement photos, it gives them a chance to be comfortable in their own space, and focus more on the connection between them, versus the a specific location. I feel more and more couples are opting for these cozy in-home sessions."